The Teen Titans haven’t always met with success since Damian Wayne reformed the team back in last summer’s TEEN TITANS #20…but they’d better find their A-game quickly. While Damian is still recovering from a recent battle with Red Hood (the less said about that, the better, as far as Robin is concerned), he’s nevertheless set his sights on a new criminal target—Deathstroke. 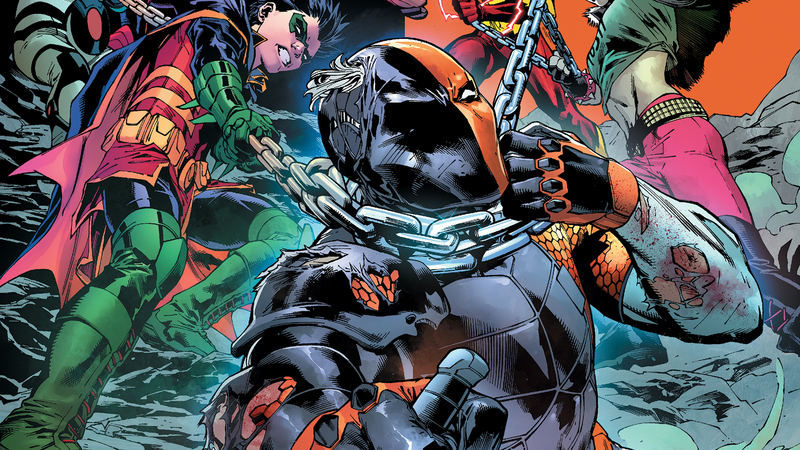 In last week’s DEATHSTROKE #41, it was revealed that Damian has a plan in motion to bring down the longtime Titans nemesis, who seems to be an agent of the mysterious and deadly crime lord known as The Other. Damian’s plan will come to light in Wednesday’s TEEN TITANS #28, which kicks off “The Terminus Agenda,” a thrilling new four-part crossover between Adam Glass and Bernard Chang’s Teen Titans and Christopher Priest and Carlo Pagulayan’s Deathstroke. However, first he’ll need to convince the Titans that they’re ready for this mission, something which they’re not the least bit confident about. Can you really blame them? In recent months, Damian, Red Arrow, Kid Flash, Djinn, Crush and Roundhouse have found themselves knocked down by super-villains and their own insecurities, and while they’ve all gradually grown closer to each other, they’re still not always tight as a team. But to bring down Slade Wilson, they’ll need to put all their doubts aside and work together more effectively than ever before. Because as Deathstroke has proven time and time again, he doesn’t lose often, and he doesn’t think twice about putting his enemies down permanently. No matter how young they happen to be. TEEN TITANS #28 by Adam Glass, Christopher Priest, Bernard Chang and Marcelo Maiolo is in stores Wednesday.